Every year, LOCO’s Kickstart Your Comedy Career course gives 60 selected students a chance to learn from comedy filmmakers, writers and producers. This year, for the first time, we’re delighted to present a public masterclass with one of Britain’s leading creators of comedy, followed by a chance to ask your own questions. 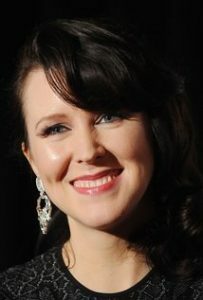 We’re delighted to welcome Alice Lowe as our guest for the very first LOCO Comedy Masterclass. Alice is one of the most original, intelligent and unpredictable talents in contemporary British comedy, working in live performance, short film, television and cinema. Alice’s television work includes The Mighty Boosh, Black Books, Little Britain, Garth Marenghi’s Darkplace and Horrible Histories, and she has appeared in films at every LOCO festival, including LOCO Discovery Award winner Burn Burn Burn and nominees Chubby Funny and Aaaaaaaah!. Alice was the co-writer of Sightseers (2012) and in 2016 wrote, directed and starred in her award-winning feature debut Prevenge. Alice Lowe is a actress/writer/director. She recently made her directorial debut with PREVENGE, in which she also starred whilst 8 months pregnant. Premiering at Venice and then Toronto, it has toured the world. It was BIFA nominated and won Monster Fest Innovation award, along with many other accolades. Her screenwriting debut was with SIGHTSEERS, directed by Ben Wheatley. This won her Best Actress awards at Sitges and Pifan international festivals, along with several screenwriting awards for her and her co writer Steve Oram. SIGHTSEERS won the Empire Award for Best British Film. As an actress she has appeared in several TV series and films. Locke, Paddington, Hot Fuzz, Inside No 9, Horrible Histories, Sherlock, etc. She co-starred in C4’s cult hit GARTH MARENGHI’S DARKPLACE. And won a Perrier Award for her involvement in the stage show of the same name. Alice has written three series of her surreal sketch show ALICE’S WUNDERLAND for BBC Radio 4. She has toured as Steve Coogan’s support act and performs live character comedy. She is currently developing her next feature.